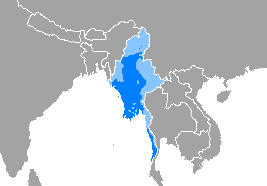 The Burmese language (မြန်မာဘာသာ, MLCTS: myanma bhasa, [mjəmà bàðà]) is the official language of Myanmar. Although the Constitution of Myanmar officially recognizes the English name of the language as the Myanmar language, most English speakers continue to refer to the language as Burmese. In 2007, it was spoken as a first language by 33 million, primarily the Bamar (Burman) people and related ethnic groups, and as a second language by 10 million, particularly ethnic minorities in Myanmar and neighboring countries.